Eldar and Kiryl are doing their volunteering stage in Baia Mare, until the end of February! They shared their thoughts with us, having recently arrived in their hosting location. 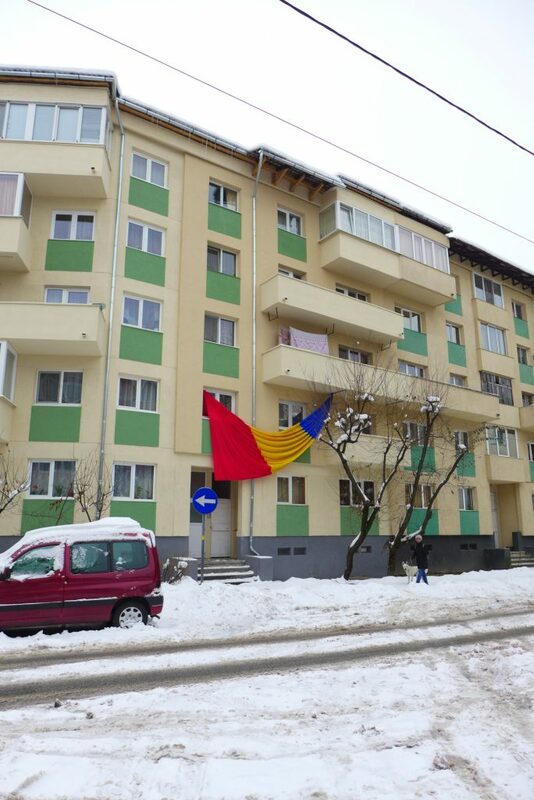 ”My first days in Baia Mare are accompanied by true winter weather while volunteers and staff are getting back from Christmas holiday to their work. The current phase of the project ‘Citizens of the World’ we start with an introduction – learning the city, community and objectives of the organization, meeting other volunteers, planning upcoming activities and evenings together to know each other. Having spent only a week here I can see, surprisingly, enough developed volunteering infrastructure in Baia Mare. There are lots of projects running by local organizations that host young people through EVS from other European countries. It creates unique atmosphere in here with its own ‘volunteering community’ inside the city. My project in particular has the aim of sharing Belarusian-Romanian social issues and diversity. At the same time I’m glad to find out similarities in food, naming streets after important historical events that are the same for our countries, or even languages… yep. Romanian ‘da’ brings me back to home. That is to say, the same word – the same meaning. All of those are also about the project which I need to take into consideration. I’m inspired to be here and have this opportunity to implement my ideas and learn new knowledge. Hopefully, this time will be enjoyable and educative for me. ”When you’re in Baia Mare and first meet volunteers from Italy, Spain and Portugal they ask you a following question – Where are you from? Do you know why? If you think that they do it because everybody does it at a first meeting then you’re mistaken. They ask about it because for them winter in Romania is really weird. And when I answer them that I’am from Belarus, they say – A-a-a, it means the weather is OK for you, right? In fact, in Belarus and in Romania the winter is quite similar. But in Baia Mare, unlike Minsk, much more snow. Do you know why? Not because the town is located among mountains or something else. The right answer is: There is a lot of snow in Baia Mare due to the fact that municipal services rare and badly clean sidewalks. On the one hand, it’s a bit dangerous because you can fall in any moment, but, on the other hand, snow ‘mountains’ together with the illumination create some special atmosphere in the town, something like a festive mood. I have never lived in small towns in such as Baia Mare (135 K). And I was impressed how fresh the air is here. I also paid attention to the rhythm of life of a local residents. People are in no hurry and look like post-communist and a bit European people at the same time. The two volunteers are hosted by Team for Youth Association in a joint project with Office of Initiatives Promotions from Minsk, Belarus, on a two-month European Voluntary Service project. The content of this testimonial does not reflect the official opinion of the European Union. The responsibility for the information and views expressed in the article rests entirely with the author.